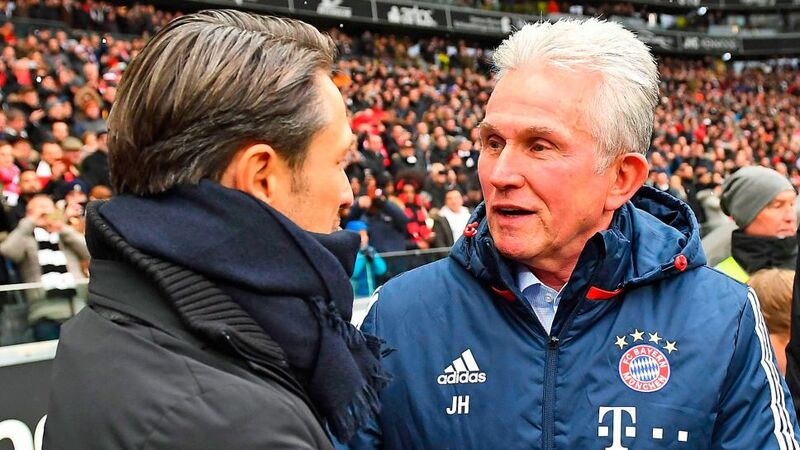 Bayern Munich will name the successor to coach Jupp Heynckes “by the end of April at the latest”, club CEO Karl-Heinz Rummenigge has confirmed to German TV, but it will not be highly-rated Eintracht Frankfurt coach Niko Kovac. Heynckes could lead Bayern to a treble this season, emulating the historic achievement he orchestrated in the 2012/13 season. The 72-year-old retired after that unprecedented success only to be tempted back for a fourth spell at Bayern when the club was seeking a replacement for Carlo Ancelotti last October. Regardless of how the season ends, however, Heynckes is set to leave his position in May with Bayern closing in on the man they want to lead them into the 2018/19 campaign. Watch: Bayern's treble-winning season under Heynckes in 2013! One thing is certain, however: it will not be Frankfurt tactician Kovac, who played in the Bayern midfield alongside current sporting director Hasan Salihamidzic between 2001 and 2003. "There has been no contact from Bayern Munich regarding Niko Kovac so it's not an issue for us," Eintracht sporting director Fredi Bobic told the official Frankfurt website on Wednesday. "The Hoffenheim game is the only thing we're focusing on now. It'll be a six-pointer." Kovac himself also played down the chance of any move back to Munich: "Right now there's no reason to doubt that I'll be here next season. I have a contract until 2019 after all." That further reduces Bayern's options after Rummenigge confirmed earlier this week that Thomas Tuchel will also not be taking over the reins. The former Borussia Dortmund and Mainz boss has been out of the game since leaving Bayern’s rivals last summer. The tactician was contacted by Bayern, but has since informed them he has already agreed to work elsewhere.